I feel as though I've been missing in action lately. I'll stop by and post a quickie, but I don't often have the time to see what others have been up to. So today as I was running around delivering card orders and whatever else, I thought I'd just STOP and get centered. When I heard the word was "duet", I immediately thought of a whale sow and her calf. I'm deathly afraid of water because I can't swim, yet I feel I'd die if I were ever too far from it. Hmmm, deep waters for another time! Please click on this link to hear the most wonderful version of Amazing Grace with the duets of our Humpback Whale friends singing with Cecilia. The site is my friend Teresa Wagner's, a wonderful animal communicator and kindred spirit I had the great pleasure meeting during my time in California. This illustration is an acrylic painting on patterned (very thin) paper with colored pencil details which I had hoped would take me half the time it did. Oh well, I just love whales and I was into it! What a sweetly peaceful painting! This is totally awesome. I wish I could cover a whole wall with it! and the song. amazing grace makes me cry. it is such a primal song. the soulful sounds of the whales makes it even deeper. a very wonderful IF in every way, lo. Very, very beautiful and peaceful, Laurel. Love it, love it, love it! Wow, it is beautiful Lolo and perfect for the word. Your art lately has been so inspiring. i love the shine and shadows on this drawing. my doughter can't swim (yet), but she dreaming that she is under the water, and she loves it. 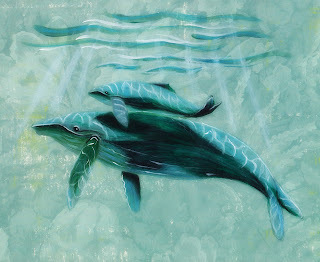 Lovely painting/drawing and what a great interpretation: the duet of whales. Everybody thinks about birds( like) me, but you dive deeper. This is a duet I would love to see in real life. Your sketch is great. I hope you had a great weekend. Lo...this is a vision of love and peace....I CAN see it covering an entire wall ..... it brings instant soothing harmony.....and combined with the whalesong..... beautiful! You are so amazing! Really! This warms my heart. Such grace and expressiveness. Love the colors and patterns. Hugs! I love to be near the water as well, I really need to. This piece is very special ! What a watery feel. No words for it. Another awesome work of art! I love water and fish and whales and seals...I think this would look great in my blue bathroom! Your paintings are so graceful!! very beautiful. I am always amazed at how you capture light - from underwater to evening shadows to dark shadows under the moonlight. I still have not tried patterned paper, but it adds so much to the background. I must take the time to try that soon! This is so beautiful! Great idea for the theme. Perfect! sounds like a perfect "problem" for being busy, delivering card orders! yay! this is incredible, i really really love it. i have heard many whale songs and seen many whales, and it never ever is enough. what a blessing to share the same planet with these amazing creatures. how beautiful! we'er two hours from the beach now, I do miss our daily morning walks on dog beach, we only saw a whale once. amazing. It's so peotic and peaceful. Great job! I can't think of a better sounding duet than a whale and her calf. Beautiful illustration! Incredible! And I love that you've explained what media you used, as I'd never have figured it out. A really beautiful piece...you should be proud! Wonderful color and energy! It so calming. Love the green/bleu color for the water, and the concept of that little one with it's mother - just great. Animal Wednesday: The Eyes Have It!